Adel Elbaih, Mohammad Ali, Yasmin Attia. Background:Abdominal trauma is a major public health problem for all nations and all socioeconomic strata. Methods:The study included adult patients attending emergency department in Suez Canal University Hospital, Data was collected in pre-organized data sheet by the researcher. Then, the patients were followed up and recorded till they reached one of these final outcomes Later on, the actual outcome of the patient was compared to the predictors and FAST results, then sensitivity, specificity and accuracy were calculated. Results:Seventy five patients were eligible, of which ten patients had a FAST-positive result, and seven patients underwent a therapeutic laparotomy. 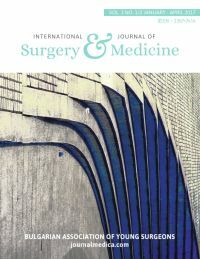 In multivariate analysis,the factors correlating with a therapeutic laparotomy were pulse (>100beat/minute), respiratory rate (>29 cycle /minute), O2 saturation, abdominal gardening by examination and a FAST-positive result (sensitivity 80%, Specificity 100%, accuracy 97%, positive predictive value 100% and negative predictive value 97.3%) ,were pulse as the most sensitive predictor (99%) followed by respiratory rate (98%) while the most specific predictors were pulse (97.1%). Conclusions:The management of trauma patients depends upon their clinical status, imaging findings, and the resources and expertise available. Rapid recognition of key abnormalities on FAST and abdominal CT can help select trauma patients for the most appropriate treatment: surgery, interventional radiology or conservative management. Physical examination alone is not sufficient to determine the need for emergent interventions. 9. Terry, Maydell, Andronikou, FAST as a predictor of clinical outcome in blunt abdominal trauma. SA Journal of Radiology, 2011. 15(4). Chinese Journal of Traumatology 2018; (): . Chinese Journal of Traumatology 2017; (): . Patterns and Outcome of Missed Injuries in Egyptians Polytrauma Patients. International Journal of Surgery and Medicine 2017; (): 1.
International Surgery Journal 2016; (): 1184-1192.